So I first tell them not to panic. Then I explain how I apply the Kitchen Test to these and a few other beverages. 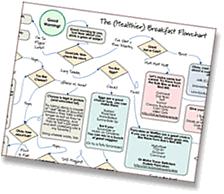 Some of them are fairly straightforward, but others have a bit of a gray area, and once again I’ll encourage you to make your own thoughtful decision about where, exactly, you want to draw the line. This is an easy answer, since beer can be made at home, and frequently is. I have several friends who make phenomenal (award-winning!) beers at home. I’ve brewed a few times with my friend Sean — he even mills the barley right before making the mash. Oh yeah, and he grows his own hops, too. The ingredients in beer are grain, water, yeast, and hops. Some “specialty” beers may add herbs or spices, and some may add other flavorings (and of course they don’t put them on the label–so those can be a pitfall), but fundamentally, beer is just those four ingredients — and it’s a surprisingly low-tech process to turn them into beer. So any traditionally made beer should pass the test with ease. Look for craft beers from smaller breweries, as some of the large breweries may use other ingredients such as corn syrup or dextrose (or genetically modified corn). 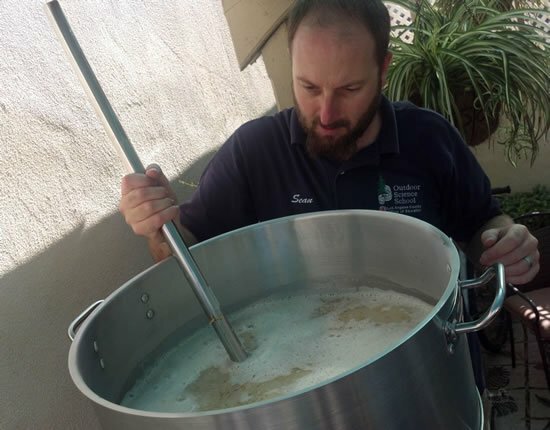 My friend Sean, making delicious, unprocessed beer in his backyard. Several of my friends make wine at home, too. (Clearly, I hang out with the cool kids…) Traditionally, wine is made with just two ingredients: Grapes and yeast. There is the question of sulfites, though. Sulfites are a naturally occurring part of the winemaking process, but most winemakers add additional sulfites to help prevent spoilage. So you’ll need to decide for yourself if you’ll seek out no-sulfite-added wine (some are available; they’ll say it on the label). For the conversation on sulfites from a previous challenge, please read Dave’s explanation and Tracy’s clarification. Other ingredients and additives may also be used in winemaking— and they’re not likely to be on the label — such as gelatin, isinglass, albumin (from egg whites), charcoal, acacia (gum arabic), and calcium alginate. These ingredients are not usually detectable in the final product. Many of them might pass the kitchen test, but others might not. Also, many are from animal sources (the charcoal may come from animal bones, and isinglass comes from fish bladders), so vegans may want to look for vegan-certified wines. Personally, I’ll drink my friends’ wines first (hint, hint), and once that’s gone, I’ll still enjoy commercial wine in October, especially if they’re biodynamic. Although I don’t recommend distilling your own (and it may be illegal in your area), it’s certainly possible to do this at home. Just skip the gimmicky flavored ones, like “Cucumber Vodka” (Easy solution: Just add your own, real cucumber!). Of course, it depends on how picky you want to be. If you’re going all-out, you may wish to consider what sugars/starches are being used to feed the fermentation process. Also note, if it’s a bottle of drink mix that contains alcohol (think “Margaritaville”), they’re not required to disclose the ingredients. Those are probably sweetened with high fructose corn syrup, and often contain artificial flavors and colors, but you have no way of knowing for sure. Yes, you can have coffee and tea! Although it would be difficult (and time-consuming) to grow, harvest, and roast/dry your own coffee or tea, it’s certainly possible. Try this fun project: Buy some green coffee beans (they’ve already been cleaned for you), and toast them in your popcorn air popper (do it outside! it’ll stink!). Or you could grow your own coffee plant, and then wet-process the beans yourself. Totally doable at home (but how much time do you have?). Just remember to keep an eye on what you’re putting into your coffee or tea! Powdered creamer and flavored creamers (which usually don’t have any actual cream in them) are not going to pass the test (seriously, check out their ingredients). I’ll be posting a FAQ on unprocessed sugar and sweeteners soon. One other big pitfall with tea: Be careful to read the ingredients list! A lot of teas now add “natural flavors” which don’t pass the kitchen test. Theoretically, milk should pass the kitchen test with flying colors, right? But this is actually one of those gray areas which I encourage you to consider ahead of time. A couple years ago I shared my thoughts on what kind of milk to drink, and I discussed some of the processing that modern milk goes through. Here’s what happens to most milk before it gets to you: To start, it’s combined with milk from hundreds or thousands of other cows. Then it’s spun in a centrifuge to remove the fat. Next, the fat is added back into the milk to the desired percentage, and the fat is homogenized [this is good description, though from an obviously biased source] to keep it from floating back up to the top. Then it’s pasteurized and finally packaged up and sent on its way to the store. So even most “whole” milk is not really whole anymore. It’s been split apart, put back together, and heavily processed. Some of those processes you could do at home (pasteurization, for example, is just heating), but others, not so much. Our favorite milk right now is St. Benoît Whole Jersey Milk. It’s organic, non-homogenized, pasture-raised, single-farm milk from a small farm in Sonoma, CA, sold in reusable glass bottles. Strauss Family Creamery is also a wonderful choice. Yes, these are more expensive than the mass-produced stuff, but they taste amazing–and don’t upset my stomach the way homogenized milk does. 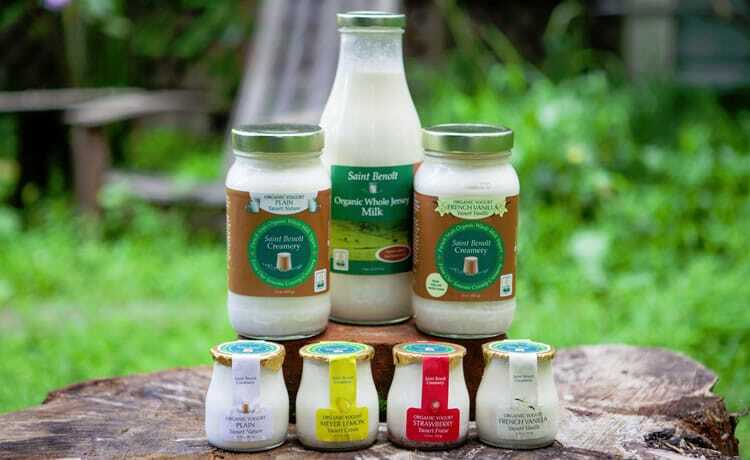 If you can’t find either of those, see if you can locate Organic Valley Grassmilk which may be distributed more widely. I encourage you to do your own research and thinking on this, try to find out as much as you can about the milk you and your family is drinking, and decide where you want to draw the line for yourself. 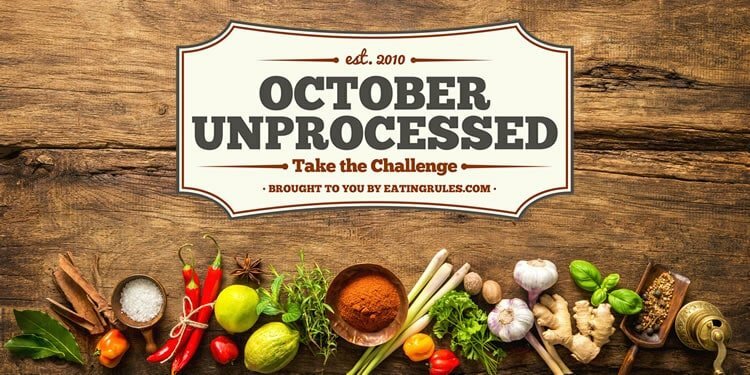 Personally, this October I’m going to drink only non-homogenized milk from grass-fed cows. You can actually make soymilk and nut milks at home fairly easily. Here’s how to make soymilk, how to make almond milk, how to make coconut horchata. However, most commercially produced faux milks contain other ingredients that you wouldn’t use at home. Carrageenan, for example, is a thickening agent that’s derived from seaweed. (It also upsets my stomach; your mileage may vary.) Here’s a comparison of two popular brands. West Soy’s Organic, Unsweetened Soymilk: Filtered Water, Whole Organic Soybeans. * Update 2016: It looks like Silk has removed the Carrageenan from this product, and replaced it with Gellan Gum. But it still has Natural (AKA Fake) flavor added. So read the ingredients, and go from there! It’s a similar story with Coconut Water and Milk. Coconut Water ought to be just the water that comes out of the inside of a coconut when you crack it open. You’ll need to read the ingredients list to be sure — some producers will add other ingredients to help “flavor” or shelf life. And some are actually “from concentrate.” If anyone has any good coconut water brand recommendations, please share them in the comments. Traditionally, coconut milk is simply the liquid that comes out of squeezing/pressing shredded coconut “meat.” But you’ve got to watch the same pitfalls — a lot of packaged coconut milk adds flavors, gums, and sugar. So read the ingredient list! Kombucha has become quite popular in the past few years, as it’s like a natural soda with the potential benefits of active cultures. If the store-bought stuff is made in the traditional way, it passes the kitchen test — since it’s fairly easy to make Kombucha at home. Again, read the ingredients! Let’s take orange juice, as an example. Oranges aren’t a year-round crop, so in order to get “not from concentrate” O.J. anytime we want, the juice folks squeeze the oranges when they’re in season, and store the juice in large tanks. To keep it from spoiling, they remove all the oxygen. Unfortunately, that also removes the flavor, so they have to add the flavor back in. Legally, in order to maintain the “100%” moniker, the flavors need to be derived from oranges themselves, but beyond that, details are sketchy. Each company has its own “flavor pack,” which ensures their own unique, consistent flavor profile. Here’s more detail, if you want it. So does that pass the kitchen test? For me it doesn’t, but I’ll leave it to you to decide for yourself. 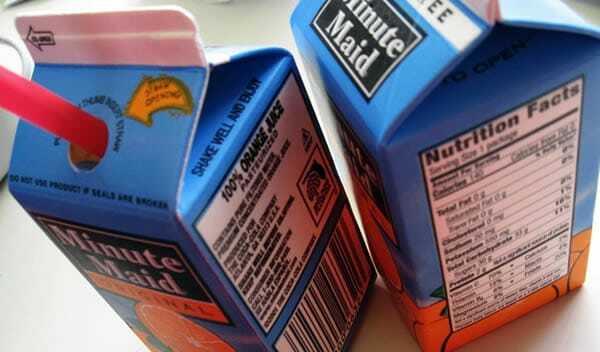 In the meantime, if you can get your hands on a few actual oranges, try a side-by-side comparison, and then let us know if you think the boxed “100% juice” really does taste the same as truly fresh-squeezed. Obviously most commercial sodas like Coca-Cola or Pepsi aren’t going to pass the test. Besides the processed sugars, there are all sorts of other additives that wouldn’t be considered whole foods. The name “Club Soda” is often used interchangeably with seltzer, but it may have other salts or minerals added. The ingredients in Canada Dry Club Soda, for example: Carbonated Water, Sodium Bicarbonate, Sodium Citrate, Potassium Sulfate, Disodium Phosphate. Those minerals may sound worse than they are, but at least for October, I’m going to stick to plain water (sparkling or otherwise) without the extra stuff. My thinking is that we need to be smart about this. In North America, you don’t want to drink water directly from a stream or lake without purifying it first (giardiasis is no fun) – so even if you were to take the kitchen test to the extreme and retrieve your water only from a stream, you’d still need to boil or filter it to keep from getting sick. I’m a big fan of municipal tap water – I’m incredibly grateful that here in the U.S. we have as much clean, safe water to drink as we want, and it’s essentially free (Flint, Michigan notwithstanding…) We do have a small under-counter filter on the cold water line that helps improve the taste. As with some of these other beverages, I’ll leave it to you to decide where you draw the line. Perhaps you’ll eschew all store-bought bottled water in October, and stick to refills from the tap? Or if you don’t like tap water, consider upgrading from cases of individual bottles to refillable five-gallon bottles? If nothing else, it’s certainly better for the planet. Did I miss any beverages you want to know about? Any other details or information you want to add for any of the above? Please leave a comment and let’s discuss! “Soda Pop!” Copyright 2010 Roadside Pictures, used under creative commons license. “Sean Making Beer” courtesy of Sean. St. Benoit Milk and Yogurt, courtesy of St. Benoit Creamery. “Juiced” copyright 2008 ashleigh290, used under creative commons license. 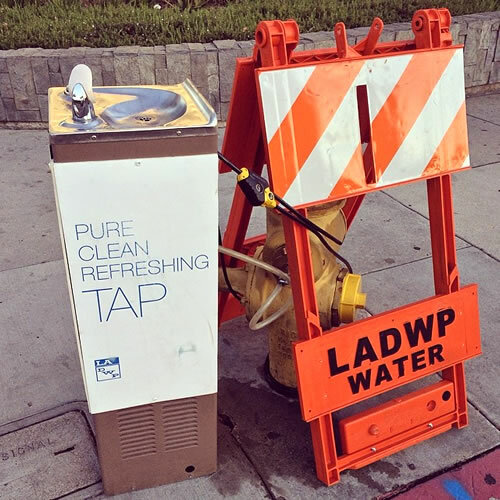 Los Angeles Department of Water & Power Drinking Fountain is from my own Instagram feed. Well, I have two beautiful milk goats in my small pasture. My milk is fresh, raw and organic and the best tasting milk you will ever have! I make my own cheese, yogurt and buttermilk. And yes I have chickens for fresh eggs and a large garden. I’m half way there! Maybe this will inspire me to make my own almond milk!! I have a Soda Stream and will add some fresh squeezed orange, lemon or grapefruit juice to the seltzer for different flavored drinks. How about almond milk & coconut milk? Almond milk is fine, as long as the ingredients all pass the kitchen test (it could be made with just almonds and water, or they could add other stuff…just like the soymilk example). Similar story with Coconut Milk. Traditionally, coconut milk is simply the liquid that comes out of squeezing/pressing shredded coconut “meat.” http://en.wikipedia.org/wiki/Coconut_milk But you’ve got to watch the same pitfal — a lot of packaged coconut milk adds flavors, gums, and sugar. So read the ingredient list! I would think coconut and almond milk are the same as soy milks and nut milks mentioned above. If you’re trying to go unprocessed, almond milk isn’t that hard to make yourself.